From choosing what company to book with and what gear to pack, preparing for the Inca Trail can be daunting. 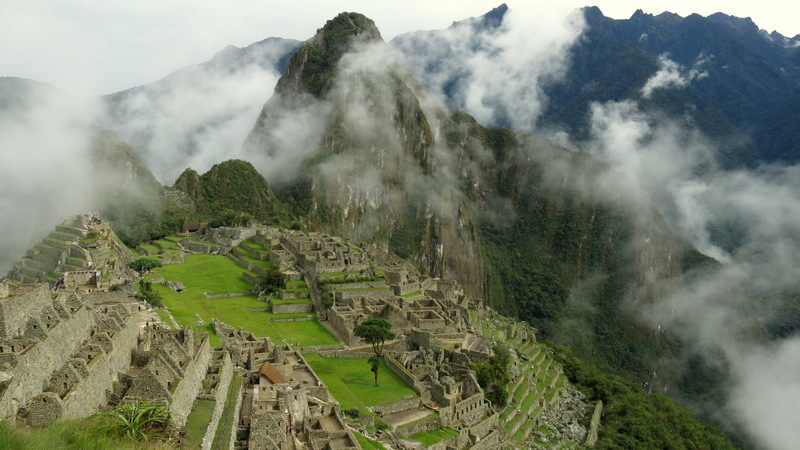 The 4-day hike to Machu Picchu, one of the newly named Seven Wonders of the World, appears on so many bucket lists, from expert hikers to first-time explorers. If it is your first time, or you haven’t been in ages, here are some quick tips to help you prepare for the journey of a lifetime. Unfortunately, the days where you could hike the Inca Trail independently are long over. You must go with a tour company, so do your research beforehand on the company’s reputation and sustainability policies. This site is updated with sustainable companies that aim to improve Peru’s economy, treat porters fairly, and have adequate equipment. You might notice the list doesn’t include the cheapest tours offered; often the lowest price companies cut corners on food and equipment, and even exploit porters. I doubt anyone wants rice for four days solid, a tent with a hole in it, and a porter who is being mistreated. Always check your contract to see what you’ve been promised. Bear in mind that you may also need to book months in advance, depending on what time of year you go. High season is June to August. 2. You will have to carry your gear for the entire trek. Some of us love to pack more than others. But before you pack multiple outfits for each day, remember that you will be carrying those items up the trail or paying extra fees for the porters to assist you. Normally the tour company arranges to have a porter carry your tent; however for an additional $75 a porter will take another 20lbs from you. sensible hiking boots that are already broken in for the long hiking days. Before you depart on your trip, it’s wise to consult the tour company for a more thorough packing list. 3. It’s not a walk in the park. Being a classic bucket list destination, many people seem to overlook the physical requirements of the trail. It’s not a technically difficult trail, however it is located in high altitude, which makes everything more challenging. Get acclimatized for the trail before you start. Arrive in Cusco, the main city near the start of the trek, at least two days before you’re scheduled to begin the trail. At 3,500 meters (11,480 feet) above sea level, the elevation in Cusco will help get your body used to the 420-meter (13,780-foot) pass you’ll be hiking on day two. In the city, most restaurants and hotels offer coca tea, a herbal tea that acts as a mild stimulant which helps with the headaches of high altitude. Prior to the trek, your guide will likely make a stop to purchase coca leaves. Locals believe that rolling the raw leaves into a ball and chewing on the plant is key in surviving the high altitude trek, however, there is no evidence to support it as normally only half of a tour group will indulge. Once on the trail, the granite path climbs over high-altitude peaks and descends over ancient staircases, all wreaking havoc on your knees. In addition, most trekkers carry an extra 20-30 pounds of gear. Get in shape pre-trek by hiking up a steep hill (or up and down multiple staircases) with a 10lb bag on your bag for at least an hour a day. Do this for a month solid and you’ll be physically prepared for the trek. 4. There will be rain. The third day of the trail takes hikers into a cloud forest, a subtropical ecosystem where clouds, mist, and rain constantly roll over the Andes Mountains throughout the day. As you walk into the lush and tropical Amazon, remember: you are in a rainforest. It will rain at some point, so bring a rain jacket and weatherproof your bag. 5. It really will be the trip of a lifetime. There is a reason the Inca Trail is on so many bucket lists. Every single turn of the trail takes hikers to a place of extraordinary beauty, from alpine meadows to the lush Amazon rainforest. Every step changes the setting. By the time you finally find yourself at Machu Picchu, it’s likely you’ll have found the trek turned into something life altering. Enjoy, and make sure to bring a camera! Soft: Yarn and hats for sale in Aguas Calientes. 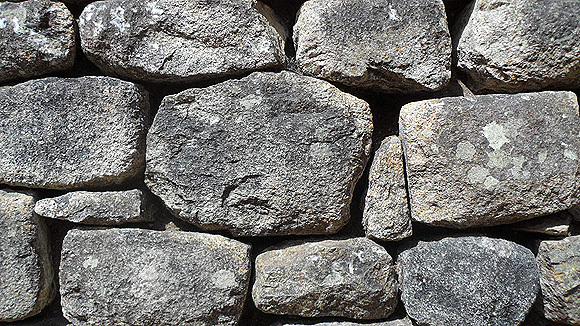 Solid: Stones stacked at Machu Picchu. 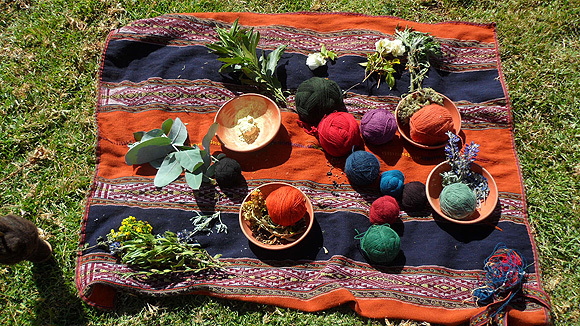 Earthy: Hand-dyed yarns (learn more about textiles in Peru). Prickly: Cacti growing on a ledge in Ollantaytambo. Alive: Flowers full of life in Aguas Calientes. Uniform: Terraces zigzag in perfect symmetry at Machu Picchu. Vibrant: Scarves and other textiles perfectly folded in Cusco. Gritty: Graffiti scribbled on a wall in Lima. Organic: Potatoes, grains, and beans ready to be cooked. Faded: Beer ads advertise two of the popular Peruvian beers. Weathered: Plants grow out of clay tiles in Ollantaytambo. 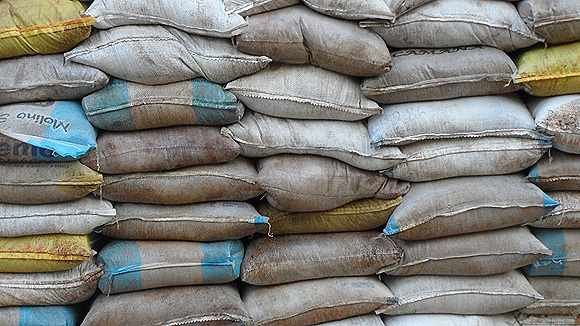 Muted: Bags of rice stacked outside a restaurant in Aguas Calientes. Sitting next to a pile of luggage in the back of a 10-seater van as we wound our way up and up through the Andes Mountains, I hoped nobody would turn around and notice my eyes were closed. I might have been able to pass my shuttered state off as jet lag -- after all, I had just arrived to Peru by plane a few hours prior. But it wasn't a lack of sleep that kept me in this state; it was the fear of looking out the window at the rocky chasm just inches from our van's tires. Our driver was a true professional, snaking the vehicle along a dirt path that came death-defyingly close to the ridge at rapid pace. But me? I was just an amateur passenger, a first-time visitor who wanted to take it all in but instead found myself squeezing my eyelids shut and grasping the vinyl seating until my knuckles turned translucent white. Without warning, our van skidded to a stop. Gripping the seat even tighter, I opened my eyes just in time to see the door fly open. Out of a cloud of red dust appeared a woman dressed in a rainbow of woven colors, her outfit capped with a flat-top hat that looked like a cupcake paper turned upside-down. In a wrap on her back she carried a baby that couldn't possibly have been older than nine months. As the woman took a seat in the van, another member of our tour group asked if she might snap a picture, raising her camera and pointing to it. The woman didn't understand the request in English or Spanish, but smiled warmly and nodded at the hand gestures. As it turns out, this was no ordinary hitchhiker; this woman was from the Amaru community, the Andean village we were on our way to visit. After a few more minutes winding up the mountain we arrived at our destination. Hopping out of the van, I took note of the surroundings: a dirt road surrounded by modest homes made of cement. Further out, a patchwork of small fields on the sloping mountains was being cultivated by farmers. As we passed through an archway decorated with flowers, more women dressed like our hitchhiker friend greeted us by placing magenta garlands made out of Peru's national flower, the bell-shaped qantu, around our necks and sprinkling us with white flower petals. The women seemed genuinely excited to have us, hurriedly buzzing around like bees getting ready to show us their craft. 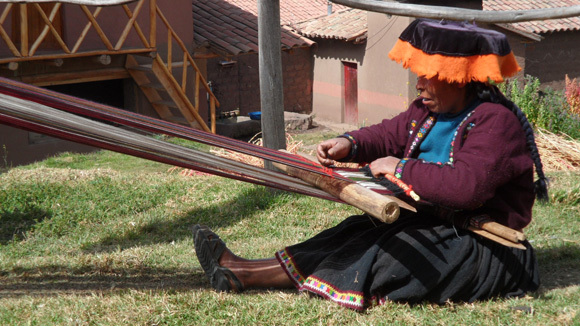 With a translator on hand, a few of the women spoke about the importance of the textiles in their native tongue, a form of Quechua (the common ancestral language of the Andes). After thanking us for our interest in learning about their traditions, the demonstration began. First came the shearing of a sheep. After corralling her and binding her feet with yarn, three women held the sheep down and took a knife to her wool. The sheep wasn't too excited about this -- and neither would I have been, judging solely by the dullness of the blade -- and began shrieking wildly. Even her young lamb swooped in to see what was the matter, but the women assured us it didn't hurt the animal -- she was just scared. Next one of the women showed us how they clean the wool using only water. The process started with an empty bowl and one full of water. Placing the wool in the empty bowl, the woman covered it in a little water and rinsed it until the water turned black. Then she dumped the dirty water and repeated the process until the water turned murky brown and eventually clear, ensuring the wool was nice and clean. No bleach, no soap -- just some water and a whole lot of patience. Most fascinating to me was what came next. The women showed us how they make natural dyes from various flowers and minerals. For each specimen they showed us the corresponding fabric that would result. From browns and burnt orange to bold greens and blues, I was in awe that they could create such intense hues. In a nearby pot boiling with water over hot coals, the women demonstrated how to dye the fabric using just the hot water, wool, and some flowers. The colors that resulted after just a few minutes in the hot pot were remarkably vivid. The women also showed us how they turn the wool into yarn, stretching it out on spindles. Everything was done by hand without the aid of machines. I should also note that there were no men present -- they were all out working in the fields. Finally, it was time to weave. The Amaru women explained that the geometric patterns in the textiles include very old codes that tell about the community's identity, customs, and desires. Even the young girls wanted to join in weaving, with the adorable girl pictured above stealing the show (by far, she was the most photographed person in the community that day!). Watching the women pass down the tradition from generation to generation made me think of my own grandmother, a seamstress who knitted, sewed, embroidered, and crocheted. Unfortunately, without her around to show me how to create textile masterpieces, I've always found that I have little patience to learn myself. Still, it's interesting to note that whether in the suburbs of Cleveland or high in the Andean mountains, many of our traditions are similar. The end result are these beautifully intricate textiles. 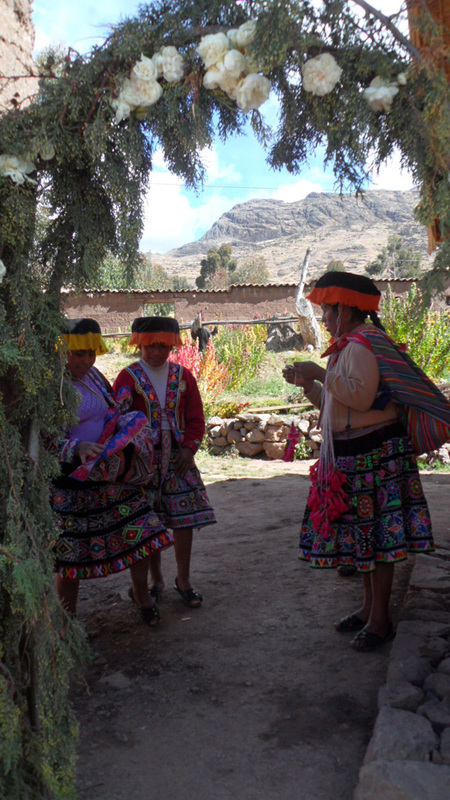 The Amaru women create blankets, tapestries, scarves, purses, jewelry, and dolls. I purchased a bracelet and have been proudly showing it off, explaining that I know exactly where it came from -- from the sheep to the finished product. In the end, spending time with the Amaru community was well worth the stress of the harrowing drive into the Andes. 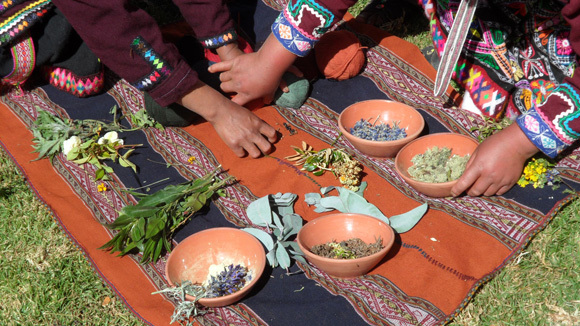 Visiting Peru and want to meet the Amaru Women yourself? The community is located about 30 minutes by car from Cusco and five minutes from Pisac. Tours (including a demonstration and lunch) and homestays can be booked through La Tierra de los Yachaqs ("The Land of the Wise"), a community-based tourism project.